The Cahokia site is located in Collinsville, Illinois, in the middle of the American Bottom floodplain of the Mississippi River, just 8 miles (13 k) northeast of St. Louis Missouri. Presently, the State of Illinois owns and preserves 2200 acres (890 ha) of this massive site as Cahokia Mounds State Historic Site, which is managed by the Illinois Historic Preservation Agency. 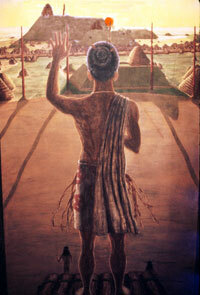 To better understand Cahokia and its major features, some basic facts are presented here. Cahokia was the largest pre-Columbian site in America north of central Mexico, covering nearly six square miles (15.5 km2). 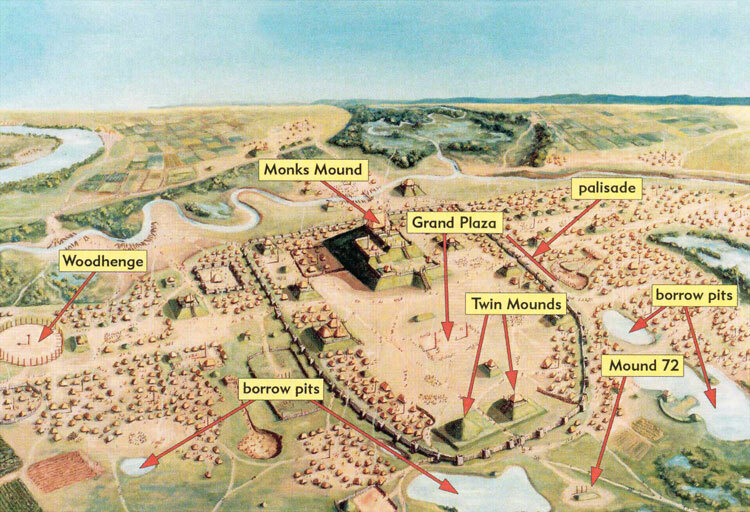 Within that area, people of the Mississippian cultural tradition (AD 1000-1400) built approximately 120 mounds of various size and shape, developed large and small ceremonial plazas, fortified the central ceremonial precinct with a 2- mile-long (3.2 k) log stockade wall, and lived in extensive residential areas. At the center of the site was the largest prehistoric earthwork in the Western Hemisphere, the 100-foot (30.5 m) high “Monks Mound,” named after a short-lived occupation in the early 1800s on a nearby mound by French Trappist monks. It covers over 14 acres (5 .7 ha) and contains an estimated 22 million cubic feet (623,000 m3) of soil, carried by hand a basketload at a time from borrow pits around the site. 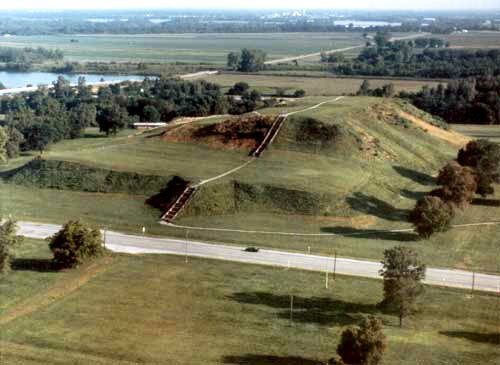 You could double that volume for all the other mounds at Cahokia, and even more if you include the amount of soil moved to build up and level the ground for their plazas, the largest of which covered over 40 acres (16.2 ha). Cahokia’s population fluctuated over the centuries it was occupied but may have reached 10-20,000 people at its peak around AD 1100. 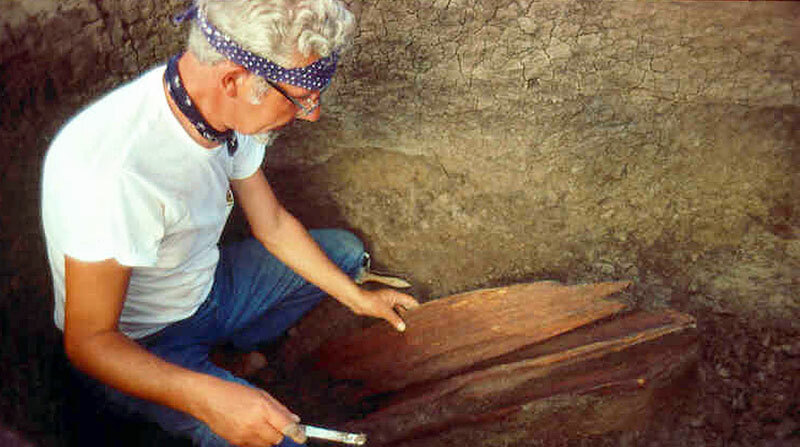 The Woodhenges (there were at least 5) at Cahokia were discovered accidentally during salvage excavations in the early 1960s when a proposed highway interchange was planned for that particular location. Excavations by Dr. Warren Wittry for the Illinois State Museum, examined the area to be impacted and the crews discovered hundreds of house and pit features, including many large post pits. These post pits were about four feet deep and had a sloping ramp leading to the bottom to facilitate the insertion and erection of large posts. These post pits intrigued Dr. Wittry and he decided to make a map of just their distribution and he then recognized they were forming arcs of large circles. This eventually led him to the conclusion that they might be full circles of posts that had been used to track the movements of the sun and used as calendars, and began referring to them as woodhenges. His colleague, Dr. Robert Hall, conducted additional excavations in 1963, following the track of several of these arcs and located several more posts where predicted, as well as evidence of some central observation posts. Wittry returned in the late 1970s to excavate as completely as possible one of the circles, and I followed up with some public field school excavations in 1985 to locate the three final posts needed to complete the circle for the third Woodhenge. 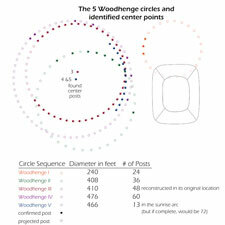 This Woodhenge had 48 posts in a circle with a diameter of 410 feet (125 m). Unfortunately, we had lost nine post locations on the western side of the circle to a highway borrow pit that was dug before we knew Woodhenges were there. Wittry found a fragment of a red cedar post in one of the post pits that had apparently broken off when the Mississippians were trying to remove it. It seems significant that red cedar was being used to construct Woodhenge, because among many American Indian groups, cedar is considered a sacred wood. In the Cahokia area it is the only native evergreen tree, and thus symbolic of life; it has a reddish heartwood, symbolic of blood and life; and it resists insects and decay. These factors led to its sacredness. We estimate the height of the posts at around 20 feet because the postpits averaged around four feet deep, however, they could have been taller or shorter. They also could have been decorated, carved, or colored in some way as Wittry noticed bits of red ochre by some of the postpits. In our reconstruction we stained the posts with red ochre. Wittry determined there were at least five Woodhenges at this same general location, each with a different number of posts, ranging from 24 to 60, and different diameters, ranging from 240 feet (73.2 m) to 476 feet (145 m). The first and smallest circle was just east of all the others, and a later mound covered part of where it had been. 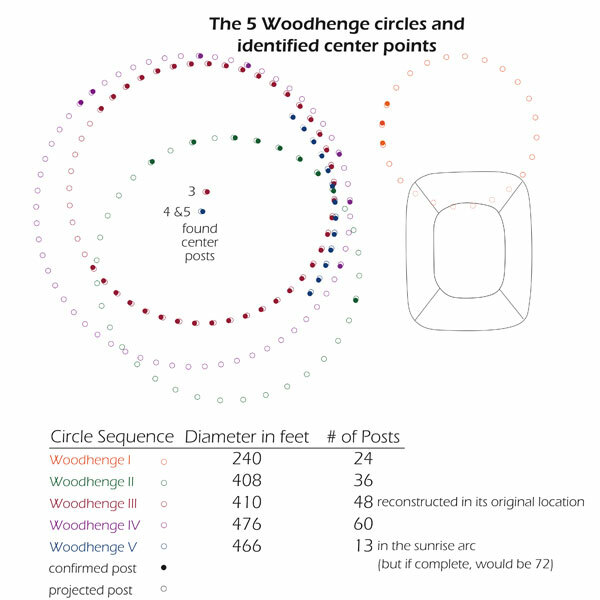 The fifth Woodhenge was not a complete circle but only had 12 posts on the eastern sunrise arc, but if complete, it would have had 72 posts. For some of the circles, only a few posts had been encountered in the excavations but the number of posts and diameter of the circles could be determined by the dimensions of the arcs connecting the known posts and the spacing between posts. 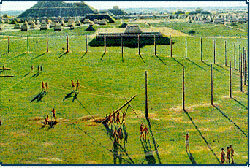 The reconstruction of the third Woodhenge was done in 1985, following the final excavations, and all the post positions were surveyed in so that the reconstruction would duplicate the original. We obtained as many red cedar logs as we could (about half) and the others were black locust. The central observation post was larger than the others and we put a large cedar post there. Our volunteers actually used a stone hoe and baskets to redig the insertion ramp, slid the post down the ramp and pulled and pushed it upright their arms and ropes, then tamped the soil down around it. We used a backhoe to set the other posts, however. 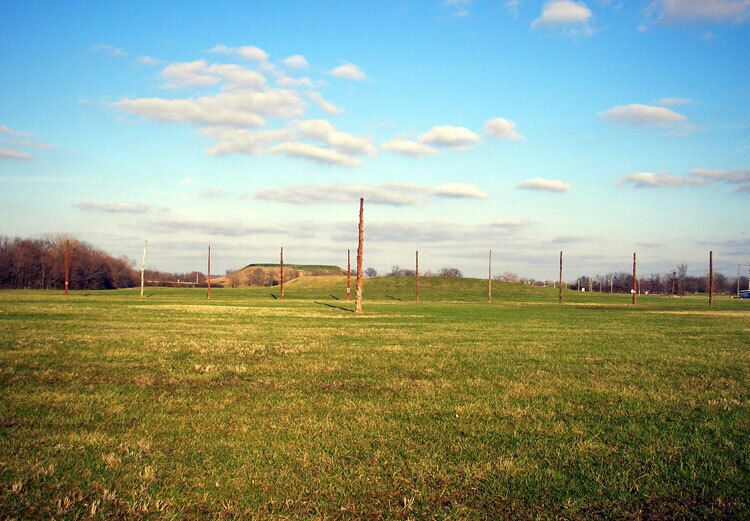 Fortunately the landowner who owned the area of the Woodhenges that had been destroyed by the modern borrow pit, recently donated that strip of land to Cahokia Mounds so that the third circle is now completely reconstructed with its 48 posts and central observation post. It is interesting that the central post is not at the geometric center of the circle but offset to the east about 5.6 feet, which makes it align better with the perimeter posts marking the winter and summer solstice sunrise positions at this latitude, and supporting the interpretation that this is a sun calendar. At the equinoxes, when the sun rises due east, it appears to be emerging from the front of Monks Mound about a half-mile away. We think this is more than coincidence in that the paramount chief who would have governed from, and possibly lived on, the summit of the mound, would have the sun emerging from his mound. We think that he may have been revered as a “brother” of the sun or to represent the sun deity on earth, and to have his “sky brother” rise from his mound would reinforce his power and authority to those gathered at Woodhenge to observe the sunrise and conduct the appropriate ceremonies. Some colleagues believe the Woodhenges were more than calendars and might have served as “aligners” to help lay out the community and placement of the mounds. If so, they suggest there would be other “woodhenges” around the city, to triangulate between them and to lay out the community in their vicinity. Another possible circle may be identified in the south central part of the site around Mound 72, but the evidence is somewhat debated at this time. 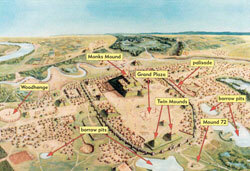 When we discuss Cahokia, we often refer to it as a “city because of its massive size and population. To schedule their rituals and ceremonies, especially those associated with the agricultural cycle, and organize other activities, a calendar device such as the Woodhenge would have been very important. Some have suggested that the increasing number of posts by 12 each may have been used as counting devices to predict and calculate cycles of the moon, but we have yet to confirm that. A group of amateur astronomers have suggested that the post north of the summer solstice sunrise post, and the one south of the winter solstice sunrise post for the third Woodhenge, could be marking the maximum northern and southern extent of moonrise positions over an 18 year cycle. 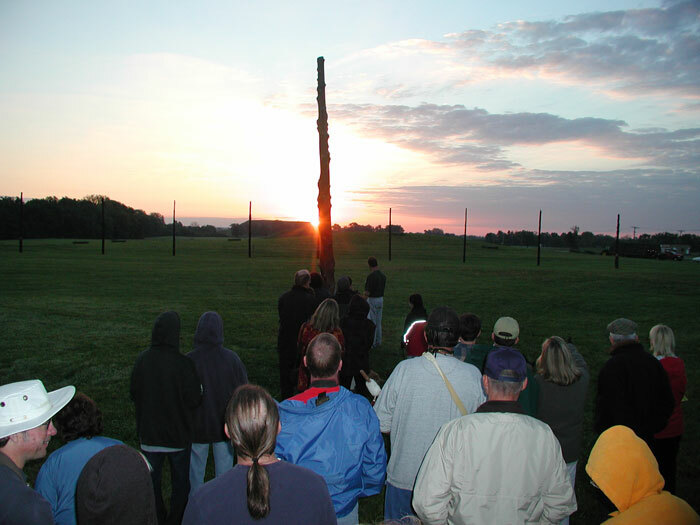 We hold public gatherings at Woodhenge at the equinoxes and solstices (actually the Sunday morning closest to each so that more people can come out and experience it), with anywhere from 30 to 100 people or more attending. We do not do any rituals or ceremonies, as we are not Indians and do not feel it is appropriate for us to do so out of respect for their beliefs. I stand on a stepladder near the center post and give an explanation of the discovery, form and function of this ancient sun calendar while we await the sun’s appearance (if it is not overcast). 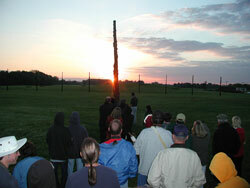 We hope to see some of you there at Cahokia sometime in the future. 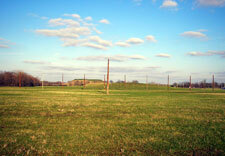 For more information about the Cahokia site and our calendar of events, go to the web site (link below). It’s nice to see some articles about other cultures of the Americas. 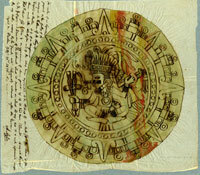 The importance placed on observing and recording the movements of the stars seems to found throughout the native cultures of America. 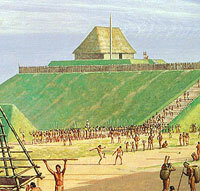 Is it known if there was any cultural connection between Cahokia and the Aztec world? Great article. I heard of Cahokia, but did not know they found old cedar wood. I thought everything that was biodegradable was gone.